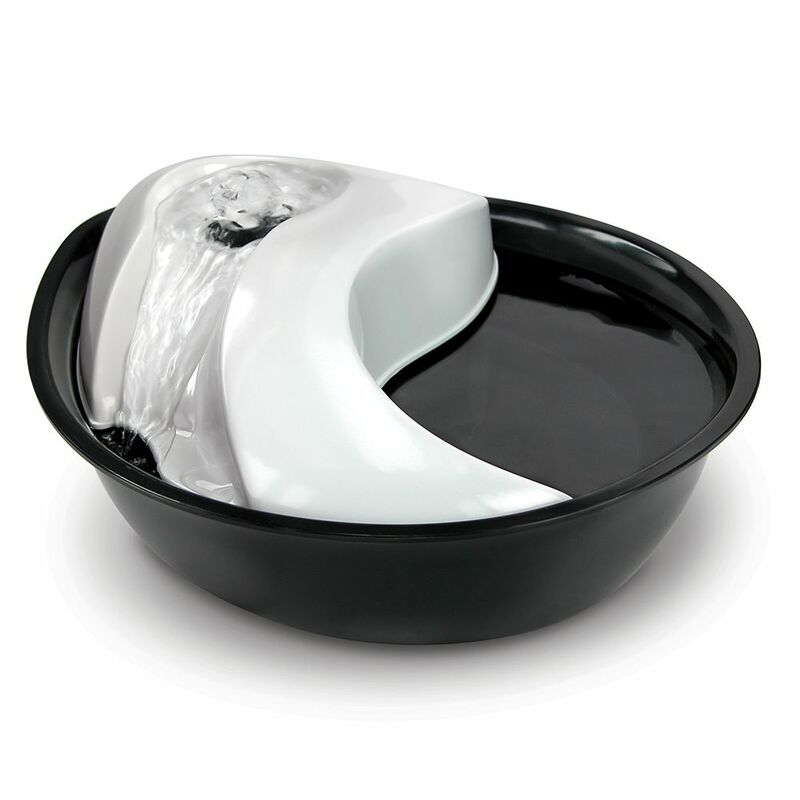 The Raindrop Drinking Fountain – Plastic is a fresh new way for your cat to enjoy its water. It is ideal for felines and also small dogs, particularly those that enjoy fresh water or that struggle to take in enough fluids. The raindrop shape of the fountain and the constantly moving water, enriched with oxygen, will animate your cat and add an element of fun to its water, helping encourage sufficient drinking. It is vital that your cat takes in plenty of water to keep its kidneys functioning well. The water in the Raindrop Drinking Fountain – Plastic is purified through a fleece activated carbon filter, ensuring your cat always has fresh, clean drinking water available. The modern raindrop design also makes this Raindrop Drinking Fountain – Plastic a real eye-catching addition to your home, and the low noise levels mean it can always be on to offer your pet fresh water without disturbing you. There is a slide control that allows you to adjust the pump capacity of the fountain, great for meeting the individual needs of your pet. Raindrop Drinking Fountain – Plastic at a glance: Drinking fountain for cats and small dogs Fresh, filtered drinking water at all times Encourages your pets to drink more: an increased water consumption can be beneficial in supporting kidney health With activated carbon filter: replaceable, to ensure a constant supply of clean, healthy drinking water Pump performance: fully adjustable with a slide control Very quiet: suitable for constant use Easy to care for: the high-quality plastic components are dishwasher proof Modern raindrop design Capacity: 1. 8l Dimensions: 29 x 24 x 11 cm (L x W x H) Material: plastic Colour: black/white Pump (consumption/voltage: 12 Volt/50 Hz/2 Watt Cable length: approx. 1. 8m Included in delivery: drinking fountain, pack of 3 filters, motor casing, shell casing, AC adapter 230-240 V Replacement Filter (3-Pack) at a glance: Pack of 3 replacement fleece and activated carbon filters 3-layered filter system with activated carbon Dimensions: 11.5 x 6 cm (L x W) Cleaning of the Drinking Fountain: Clean the Raindrop Drinking Fountain once a week using a soft sponge and gentle cleaning solution or by washing it in the dishwasher, ensuring no soap remains. Cleaning the Filter: Remove the filter from the base section and rinse it. Do not wash the filter with soap. Clean the foam matting to ensure that water can still freely flow through it. If the filter cannot be cleaned or contains foreign bodies, replace it (replacement filters sold separately). Replace the filter every 3 weeks or as soon as there are visible signs of dirt, food remnants, hair etc. The filter may require more regular replacement depending on your living environment and water quality, as well as if it used by more than one pet. Please refer to the operating instructions. Cleaning the Pump: Check the drive magnet ("propeller", "impeller") by removing it from the pump and carefully cleaning it with a cloth. As tap water contains lime,..